Even the movie isn't sure if it likes itself. Slender Man is the first feature film based on the wildly popular Slender Man creepypasta stories, but the movie’s abrupt ending suggests that the filmmakers don’t intend on producing a sequel. What we got instead a message that seems to put the franchise in an identity crisis. Warning: Slender Man spoilers ahead. If you need a refresher, the story is simple: Four teenagers decide to summon Slender Man after looking the character up during a drunken web search. To their horror, they discover that Slender Man is very much real when they start seeing nightmarish visions. Then, one of their group, Katie, disappears. The remaining friends, Hallie, Wren, and Chloe, resolve to get her back by invoking Slender Man again to strike up a deal. This ends rather badly. One by one, all the friends fall. Chloe becomes an emotionless mute, Wren breaks down into a raving lunatic, and Hallie offers herself up to Slender Man’s tentacle tree in order to free her little sister Lizzie, who gets caught up in Wren’s futile plan to get Katie back. Wren was the real MVP of this movie. That freaky tree scene would’ve been a good way to end an otherwise decent horror movie. Instead, we’re treated to an awkward narration from Lizzie who implores the audience to refrain from indulging in the Slender Man mythos because of its fatal consequences. There was some small telegraphing in the beginning of the film that characterized Lizzie as a young girl eager to impress her older sister’s friends, but her PSA still seemed to come out of nowhere. It felt more like a mea culpa for the film’s controversial history than a real ending. 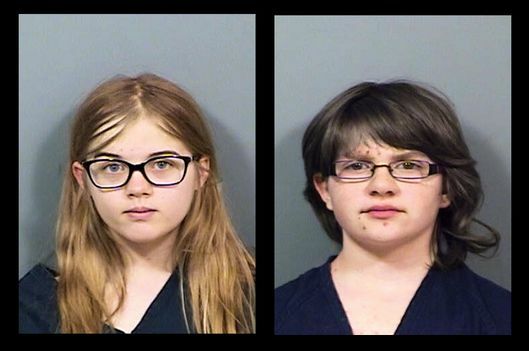 Slender Man ultimately derives its source material from the Slender Man fan fiction created by amateur enthusiasts since 2009, but it’s undoubtedly influenced by the horrifying stabbing incident in 2014, when then 12-year-olds Anissa Weier and Morgan Geyser lured a mutual friend to the woods and stabbed her 19 times. Bill Weier, father of Anissa Weier, criticized the film and claimed it was exploiting the tragedy for money. Given the timing of the planned release (Slender Man was originally supposed to drop on May 18, the same month as the stabbing), Weier might have been on to something. Could the ending have been a weird sort of apology for a project that was already too far into production? Will the filmmaker actually heed their character’s own words? It’s uncertain, but one thing is clearly: Slender Man should have never referenced the tragic stabbing in the first place. Oh, and there almost definitely won’t be a sequel. At least we got a good laugh out of seeing Slender Man turning into a giant tree spider. Seeing an eldritch monster in a business suit kind of saps the terror out of it. Slender Man is in theaters now.